– This classic pair of PJs was designed for comfort in mind. Stitch them up in a lightweight linen or cotton (or even a soft, older sheet!) for spring/summer and make them out of a cozy flannel for fall and winter. – You will need 1 1/2 yards to make the size 2/3 or 2 1/4 yards for the largest size (6/7). – The pattern also calls for a turning tool, 4 buttons, a package of pre-made coordinating piping or 60″ of bias tape, 1″ wide elastic, and (optional) water-soluble basting tape. This classic look is adorable on kids of all ages and is another one that would be easy to adapt for girls as well. 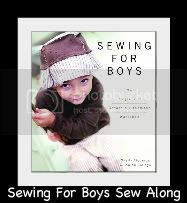 Posted on January 27, 2014, in Announcements and tagged boys PJ sewalong, pajama pattern boys, sewing for boys. Bookmark the permalink. Leave a Comment.